British brand Atkinsons has launched Pirates’ Grand Reserve, a new gourmand fragrance in the brand's Contemporary Collection. Pirates’ Grand Reserve is a rich, adventurous brew of brigands and buccaneers. Chocolate and gloriously aged rum pay delicious homage to English gentleman-pirate Sir Francis Drake, who sailed around the world under Queen Elizabeth I’s flag. As daring and romantic as the legendary explorer, Pirates’ Grand Reserve puts a dangerously intoxicating spin on a perfumery favourite: rum. Full-bodied, full-blooded and, full speed ahead, Pirates’ is a fragrance to walk the plank for. Additional notes include heliotrope, jasmine, cedar, patchouli, helvetolide and vanilla. 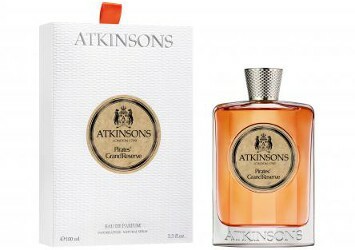 Atkinsons Pirates’ Grand Reserve is available in 100 ml Eau de Parfum. Chocolate + rum = yum ??? ?